CFP Deadline: July 1, 2016 to relicsatthelab@kikirpa.be. What information can relics give us about the people buried in the shrines? Who were these people? What do we know about the way they lived? When did they live? What about diseases and other disabilities? What information can be retrieved from the objects kept with the relics and made of textile, wood, stone or metal. What was their purpose? Are they contemporaneous to the relic or are they older or younger additions? Why would they have been added? How should we preserve them? Scientists of many different disciplines are involved in the study of relics and kindred artefacts, but till now there was no real forum for these people to exchange ideas and discuss methods. 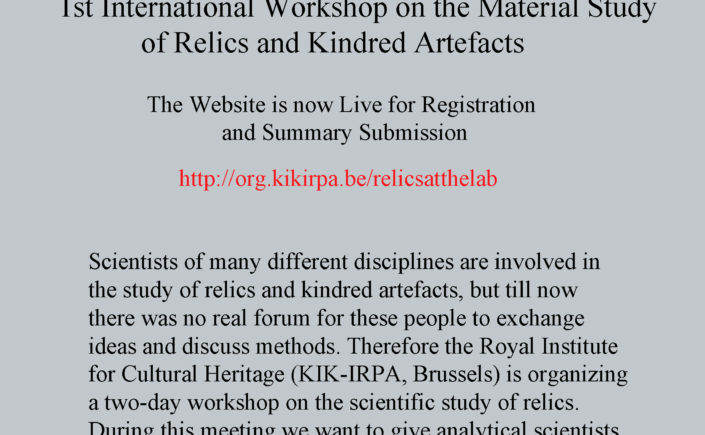 Therefore the Royal Institute for Cultural Heritage (KIK-IRPA, Brussels) is organising a two-day workshop on the scientific study of relics. During this meeting we want to give analytical scientists, textile specialists, conservators, anthropologists, historical researchers, people involved in 3D-reconstruction as well as radiocarbon dating specialists a forum to exchange ideas about relics. We fully realize that, since no such meeting has ever taken place, the organisation of this symposium is a leap in the dark. We are however convinced of its necessity and cordially invite you to join us at the KIK-IRPA on 27-28 October 2016. The registration fee is €75. This includes two lunches, coffee, tea and refreshments during the breaks and a book with the summaries of all the oral presentations and posters. Proposals for oral and poster presentations will be accepted until 1 July 2016. The program sessions will be chosen based on the submitted summaries. The conference will be held in English, each lecture will be a maximum of 20 minutes. Abstracts of max. 400 words should be sent to: relicsatthelab@kikirpa.be. For the submission of abstracts (max. 2 pages), please use the following template. A book with all accepted abstracts (posters as well as lectures) will be given to the participants. Prof. dr. L.V. Rutgers (University of Utrecht, Utrecht Center of Ancient Studies) offered us to publish the papers of our workshop at no cost in ‘Interdisciplinary Studies in Ancient Culture and Religion’, a series he’s publishing in collaboration with ‘Peeters Publishers’. Peeters is an international scholarly publishing house, based in Leuven, Belgium. Established in 1857, the company has published some 4000 titles since its foundation. Each year, around 150 new titles and 60 journals are published, both in print and online. Peeters was set up to serve the academic community by printing and publishing books and journals in English, French, and German. As a publisher, the company's main strengths are in the fields of Theology, Patristics, Philosophy, Ethics, Classical Studies, Archaeology, History of Art, Medieval Studies, Oriental Studies, Linguistics and Literature. Peeters is also well known in the academic publishing world as a printing house of the highest quality, offering print services in a very wide range of languages, scripts, and fonts. Peeters publishes original research and reference material. All publications are supervised by an editorial board and are fully and independently peer-reviewed. This offer, which we are of course very willing to accept, has a large impact on our workshop. The full-length papers should be written according to Stylesheet and SBLHS formats. The deadline for submission of the full- length papers is 1 December 2016. Posters as well as oral presentation can be published.